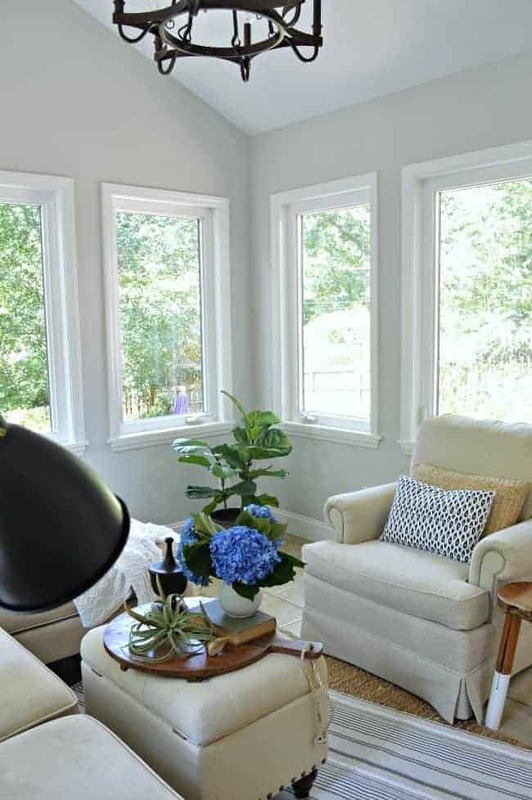 Small sunroom decorating ideas…and adding paint and lighting. *This is a sponsored post written by me on behalf of Lamps Plus. As always, all opinions are 100% my own. It’s looking so much better today but it certainly didn’t start out that way. When we first moved in to the cottage last July, we had plans to eventually turn our small sunroom into a bathroom and laundry room. It was a dirty, disgusting mess and we both had no desire to be in it. We ended up just piling our boxes on the floor and left it. After some time and a good cleaning (a really good cleaning) and the removal of the blinds, we started to soften up to the space. Once we added some furniture to the space, we knew that we would keep it as is and just do some improvements. We are really loving the room now. The great thing about it is that it’s up in the air quite a bit, so it feels like you are in a treehouse. The view is really awesome. I love to just sit in here in the afternoon with Finn and work on the computer, although I end up looking out the windows most of the time. With a new plan, we came up with several projects that we want to tackle to decorate this space and turn it into a comfortable family room. New paint, lighting, flooring, a back door (a dutch door) and beams on the ceiling are all on the list. With the powder room addition and bedroom closet happening right now though, I thought I’d do our small sunroom in stages. I wanted to get enough done so it would make an impact without taking a lot of time or money. So, the first phase of the sunroom makeover began with paint and a new light fixture. I liked the ceiling fan but the lights never worked right and the fan ticked when it was turned on. It drove me crazy. Turns out we really didn’t need a fan after all, so I went with a pretty iron chandelier to give the room a different feel. In between projects on the powder room, I began painting the walls. There’s 8 windows, a doorway and a vaulted ceiling in this room so it was not a small project. It ended up taking me 5 days to cut in the whole room (and it’s a small space). I love to paint but this was not a fun room to do. Once I was done painting, the hubs climbed the ladder and took down the ceiling fan. Not an easy job. He ended up cutting a hole in the ceiling around the mounting bracket, which was spackled into the ceiling. With the fan down, we needed a solution for the hole. The beams I want to add will cover it nicely but they aren’t going to happen for a while so we came up with a quick fix. 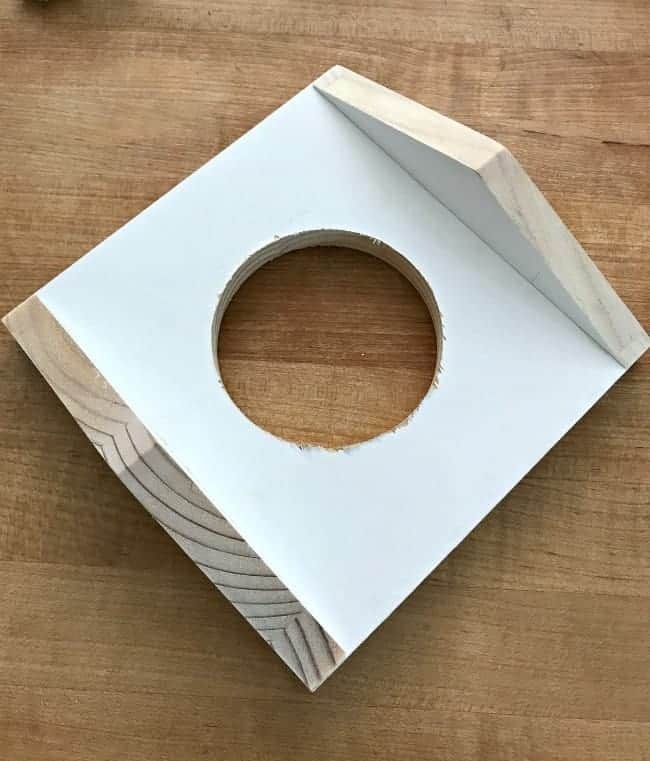 We built a simple adapter box out of scrap wood and painted it with ceiling paint. A bit of insulation was added in the hole in the ceiling, then we attached our box and hung the new chandelier. 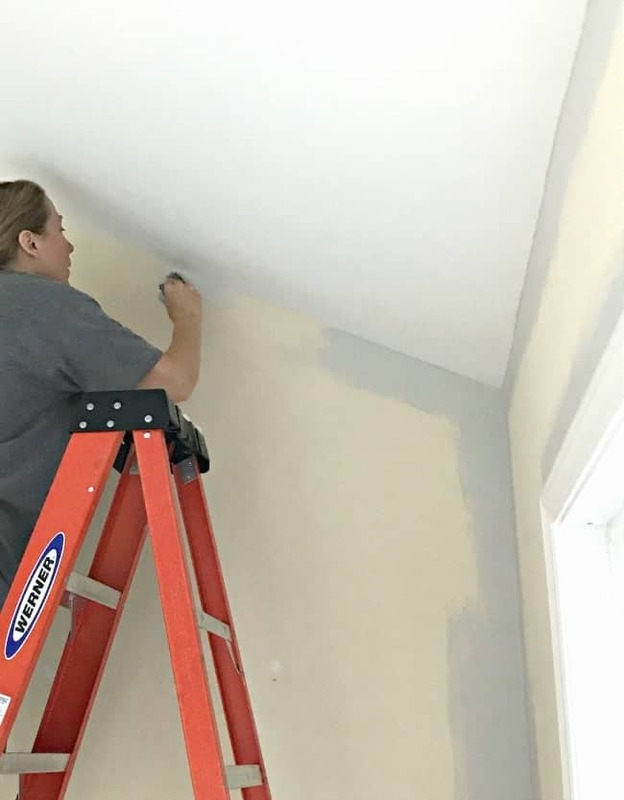 With the paint and lighting done, we tackled one last electrical project…which was to check the wiring and replace all of the outlets and light switches. Finally, it was time to put the room back together and decorate. I wanted to try a different layout so we moved the sectional to the other side of the room and laid the rug. This room is really small, and the sectional is pretty big, so we don’t have many styling options. This sofa isn’t ideal for this size of a room, but it’ll do for now. I’m really liking this new layout. I can sit and see the whole backyard, instead of the driveway and road. Loving the new light too, and the hubs went ahead and installed a dimmer for me. We didn’t have a working ceiling light in here before so it’s nice to come into this room at night with the lights dimmed. You can see the adapter box we had to build to hang the light. Remember, this was phase 1. I didn’t even hang anything on the walls yet. I’m going to take my time and look for the perfect pieces. One thing that I’m going to look for is a taller plant for the empty corner. The heating vent is right there though so I’m not sure a live plant will work. I’m also going to do a quick makeover on the back door with a coat of paint. That’ll be part of the next phase of this small sunroom makeover. I’ve also been tossing around the idea of woven shades in the windows, thinking that they’d add a bit of warmth and texture to the room. I love the unobstructed view of the trees though so I’m not sure. What do you think? Working on both rooms has done me in. I’m going to stick with only the powder room for a while. Uh…maybe??? 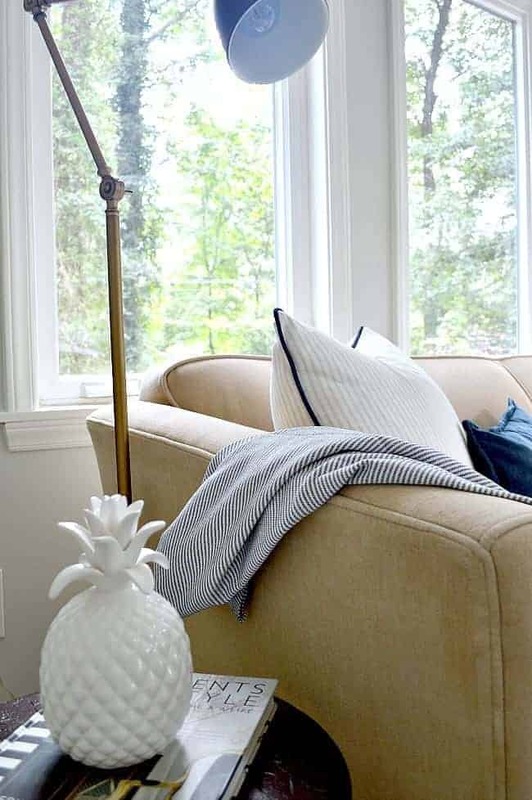 Check out our other room decorating ideas in the cottage. I can see myself sitting there curled up with a good book, blanket, cup of coffee, on a cool chilly night. That’s how beautiful and inviting this space looks. Awww, thanks so much for the lovely compliment on our room, Ivory. We are really enjoying the improved space. Thanks so much, Debbie, I appreciate it! 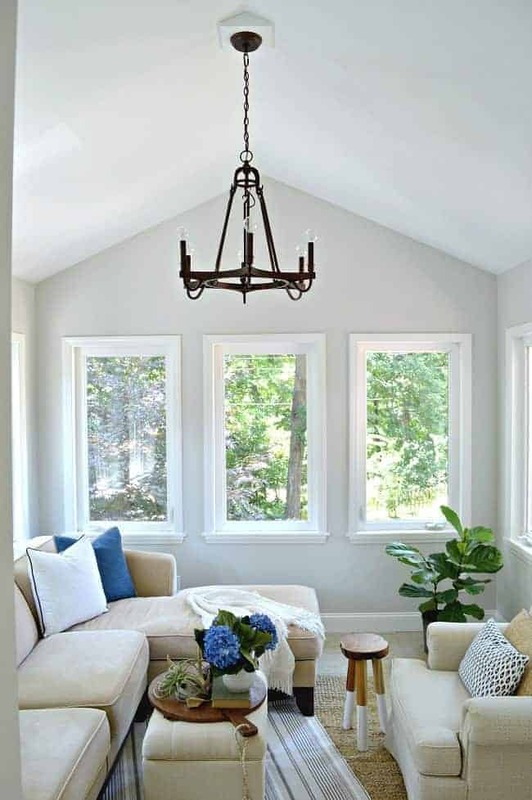 I love the light and airy look of your sunroom and your new light fixture is perfect in the space. Thanks so much, Lisa! We are really enjoying the new space. Thanks so much! We are really loving the new change. The hubs especially wasn’t a fan of the yellow walls, so he’s really happy with the new color. I love the entire room. I would leave the windows as they are but an option for me would be roman shades in white. I love the couch/sectional, where did you purchase it? Thank you in advance for taking your time to answer. THis looks great! I always like your choices. The chandelier looks great. I love the black accents. I think doing a room in phases is smart and what most of us do anyway. Part of me wants to dive in and finish a project but when i am forced to go at a slower pace and do a little here and there, I usually like the finished product better. Homey rooms take time and thought to finish well. Thanks so much, Kaycee! We are busy but I’m trying to sit in there and enjoy it every day. Problem is, I don’t want to leave. 😉 Maybe that’s not really a problem. Appreciate you stopping in Kaycee! Happy Wednesday! 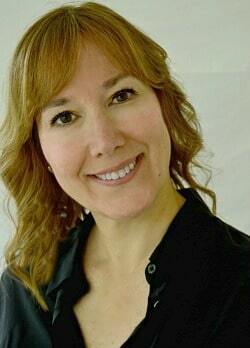 Kristi- I’m hoping you have time for a quick question. I’m considering same coffee table you have, and wonder if you are happy with it. Does it scratch easily? No more glass tops – or shelves – for me! Thanks, Pat D.
Hi Pat! I love my coffee table!! It’s heavy and sturdy and looks great in my room. Plus it never shows dust and is easy to clean. The only issue I have, if I’m being honest, is that you have to use a coaster. I’ve left a sweating glass on it a couple of times and it will leave a water mark. I’m sure it can be easily fixed but I haven’t done it yet. Hope that helps! I’d love to know if you get it. That’s a wonderful room and I know I’d hang out in it a lot if it were mine. 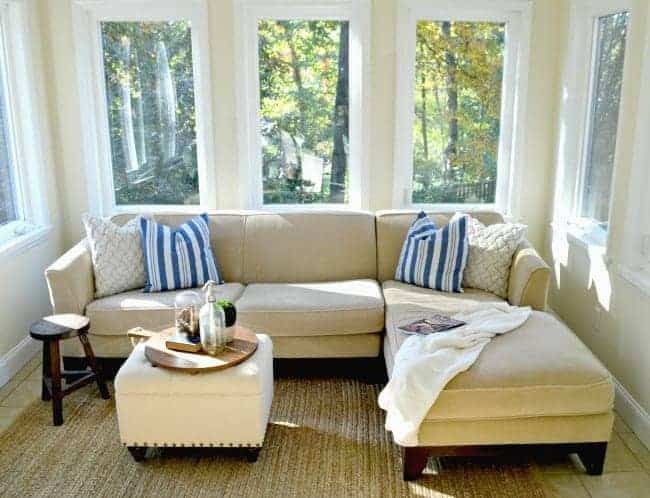 When we added on our great room I had six windows put in so there would always be plenty of light- figuring it would boost my spirit especially in the winters. We had to have a wood wedge/adaptor for our ceiling fan in the vaulted ceiling great room but honestly I don’t even notice it. Thanks Liz, we are really enjoying our room! This is the first time I’ve ever had a room with this many windows and I love it. We came from a dark house in Illinois so we really appreciate having big windows and and all this bright light. Thanks for visiting. Hope you have a great day! I love your sunroom. I was so glad to see that you moved your couch in there. I loved it when I first saw it. I have a dog that has dark hair so hot a color I can have. You and your hubby sure have great ideas and great taste. You don’t need the ceiling fan? Does that mean that the sun doesn’t heat up your sun room. I had one once and it was hot in the summer and cold in the winter. I didn’t find your blog until you moved. Just wondering what sold you on this house. I have so many projects for this house, more than I can do or afford to pay to have done. Been thinking maybe I should move but the thought of that makes me sick too! I have done a lot to this house and I just hate to leave it. Do you have to enter your spare room to get to the new 1/2 bath? Is it your plan to take some walls down and enlarge the rooms behind it? 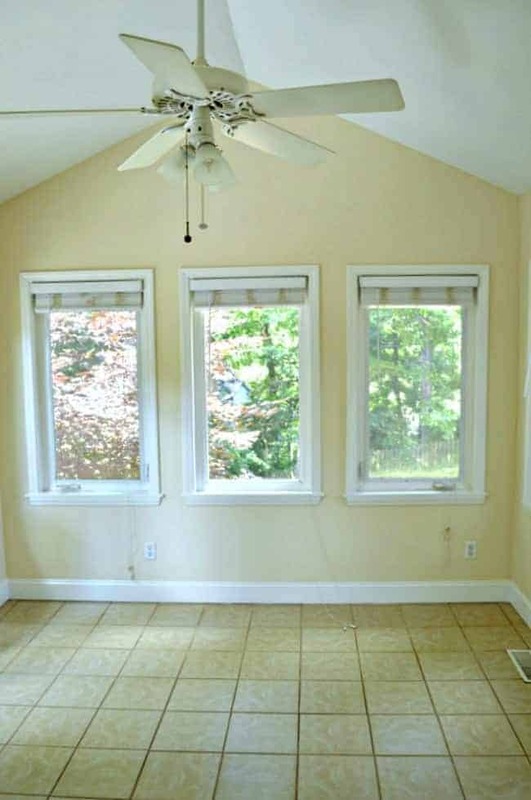 What is the paint color in the sun room? In the picture it looks almost the color of my bedroom. Thanks so much for your sweet comment, Rose. We didn’t have a lot of love for this room when we moved in but it’s become a favorite. It’s amazing what some paint, lighting and furniture can do to a space. We actually don’t need a ceiling fan. If we would have changed it when we first moved in, I would have gotten another fan but after living in here for a year, we found that the room doesn’t get hot. We have a lot of big, old trees on our property so they really block a lot of direct sun coming in. I loved this house the first time I saw it when we were house hunting. It wasn’t for sale but it caught my eye when we drove by to look at another house. Two months later, my realtor called me to tell me a house was going on the market. I drove down the street to look and it was the pretty stone house that I picked out two months before. I think it was meant to be. I think what sold me was the stone and front porch. The inside needed so much work but I wasn’t afraid of that. Having just one bathroom scared me the most. 😉 I don’t mind moving, never have, but it is sad to leave all your hard work behind. We sold our last house right as we were finishing our kitchen reno. We worked 14 long months on it and I didn’t get to enjoy it. That did make me sick. You do actually have to enter the guest bedroom to use the new powder room. No plans to take down any walls. No room to put anything unless we build an addition out the back of the house, and I don’t think that would ever happen. 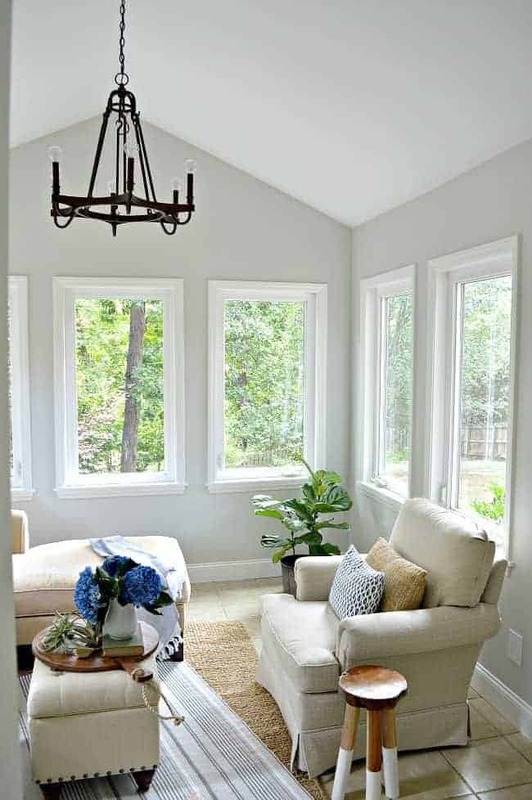 The new paint color in the sunroom is Benjamin Moore Gray Owl. I used it in our last house, in Illinois, and absolutely love it. So glad I could use it again. Thanks for stopping in and visiting with me, Rose. Enjoy the rest of your week. This is where I’d spend the bulk of my time, too. So pretty and cozy and the view is perfect. It never gets old to witness what a little paint can do! 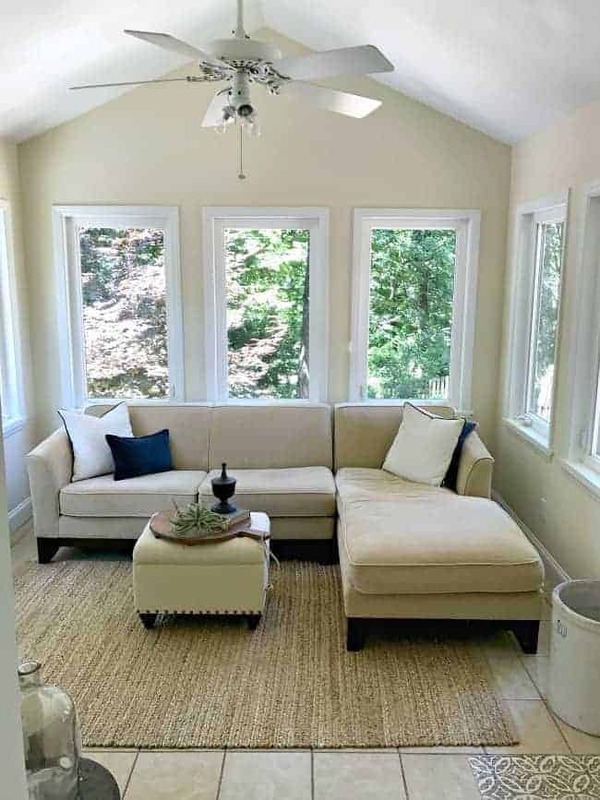 What is the color you used in the sun room? I am trying to choose a new color myself. I am having a hard time trying to get away from the golds and use something softer. Hi Cindy! 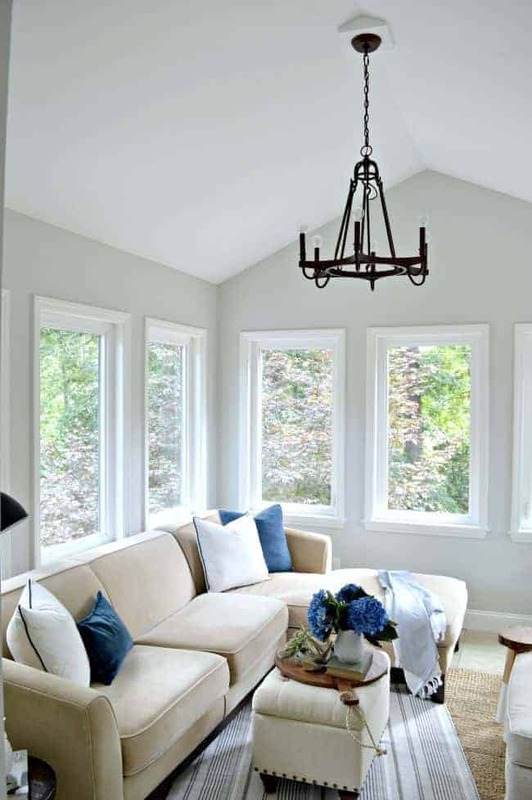 The color I used in here is Benjamin Moore Gray Owl, 75% strength. I had a hard time picking a color for this space but I’m happy with this choice. If you want to try gray and don’t want a darker color, you could try BM Paper White. It’s a very light gray. I used it in my kitchen and living room and I love it. Hope that helps. I like your room and all you have done,it looks cozy and wonderful, thanks. Thanks so much, Marlene! We are really enjoying our new space. Love that new chandelier, and what a nice room. I am no help with window coverings, in our kitchen which has three large windows as well as a slider I put nothing. I am fond of Scandinavian design and a clean look. I have added plenty of accessories which make it seem warmer and in winter months I use red to cheer things up. You always come up with nice ideas, looking forward to the next steps. Thanks so much Jillian. I have never been a fan of window coverings in my own home. If I have to use something, it’s usually just a woven shade. I’m like you, minimal is best. I appreciate the visit. Hope the rest of your week is good. You’re right, there’s something so calming about looking out a window. I like to watch the trees sway in the breeze. I love what you have done to your “new” sunroom! Unless you have a need for privacy, I would leave out any window treatments. The view sounds wonderful! Did you do anything to the floors besides add a rug? Love the new paint color; the new light is the perfect color and size for the room, it draws the eye up. The solution you found for hanging the light is perfect – I’d leave it permanently. How about trying just one blind to see if you like the look? If you used the type with the overhang on top and hung it a bit above the window, very little of the light would be blocked. Thanks so much Pat, I appreciate it. I wasn’t sure if I should go with a ceiling fan again or a chandelier but I’m thrilled with our choice. I may try your suggestion. Hubs doesn’t want me to do anything but I won’t be satisfied until I at least give it a try. We’ll see if I find something that I like. Thanks for your input. Have a great week! Thanks so much Ginger. Our house in Illinois was always dark so having all of these windows and an awesome view is awesome! You are so right, they do look like picture frames to our yard and it’s an ever changing view. As with everything else in this house, I love this little room. 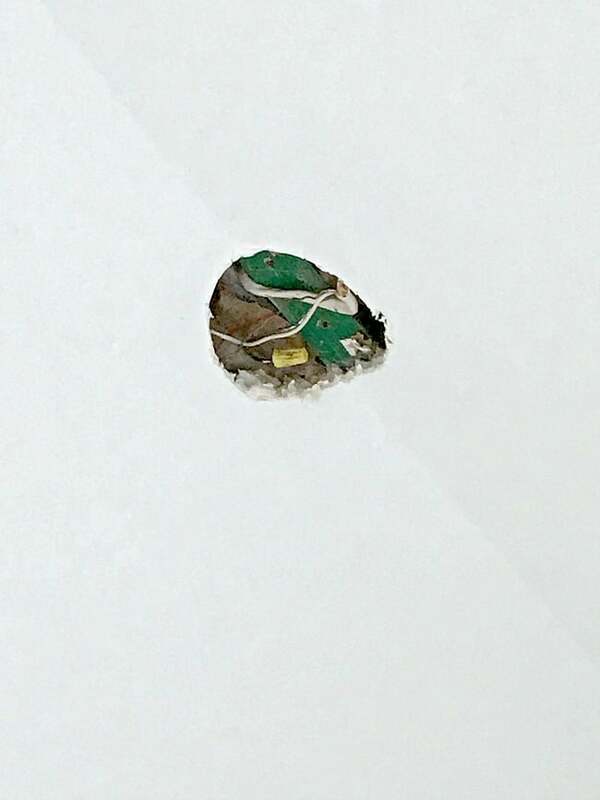 The “makeshift” cover for the hole in the ceiling looks as though it was meant to be, and the light fixture is perfect. I am confused as to how the view from this room is up higher. Could we maybe see its location from the outside of the house? Those of us who follow you and absolutely LOVE small homes are fascinated by yours and what you’ve done with it and try our best to imagine the layout in our heads. Can’t wait to see your bath/closet when it’s finished. Thanks so much Pat, I appreciate it. Yes, I think the hole in the ceiling cover worked out well. I will try to take a video of the outside of the house to show the landscape and how the back is in the air. Basically, we are on a hill and the front of the house is on the top of the hill and the back, where the sunroom is, is downhill. I’d say we are maybe 15 feet in the air. So we walk right out the front door into our yard but have to go down steps to get into the back yard. Does that make sense? I’ll definitely shoot a video. I’ve wanted to share the outside flowerbeds since we moved in. Time just flies by. I love your sun room, it’s got such an airy and peaceful atmosphere. 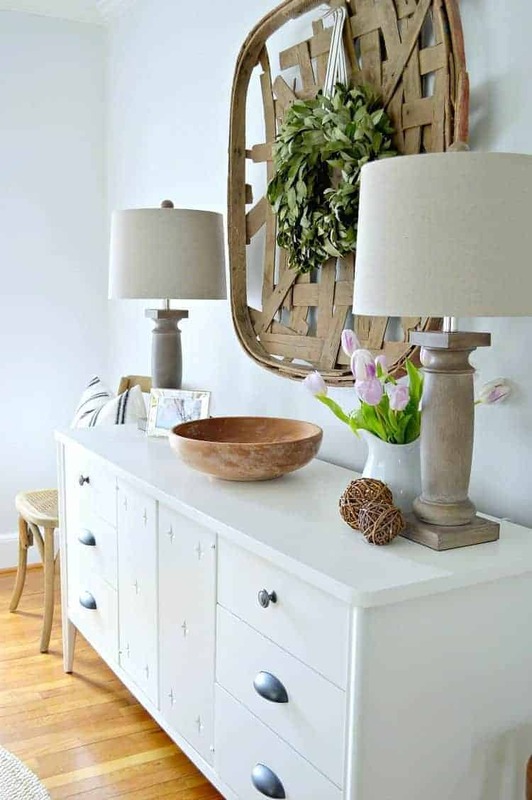 Absolutely love the light fixture as well. You two work so well together! People laugh when hubby and I mention that we work well together because I am pretty quiet but unafraid to speak out, and he is – um very loud. But we are a great team when working together! He’ll do anything I ask and vice versa. Can’t wait to see the powder room! Thanks so much! We are loving our new space. You and your husband sound just like us. He is loud and I am quiet but we do work very well together. I guess what they say is true…opposites attract. 😉 Thanks for following along! Looks great I have a small room with 2 interior doors, 1 exterior door , 2 long windows 1 closet and a pass through to the kitchen. I love that you came up with a work able layout. I have never found a decorating solution. Thanks so much! Wow, that is one difficult room to decorate around. I have found, with small spaces, that you have to ignore things like windows. Our bedrooms all have windows in odd places and I just ignore them and place the bed where I think it looks best. Not easy to change your mindset, but when you need furniture in a room, that’s what you have to do. 🙂 Hope that makes sense. I think the sunroom looks terrific! I love the light fixture and the adaptive cover your husband made. I would just leave it as it is now as it adds a decorative aspect. If privacy or additional color are concerns for you, then consider a small valance or roman shades. 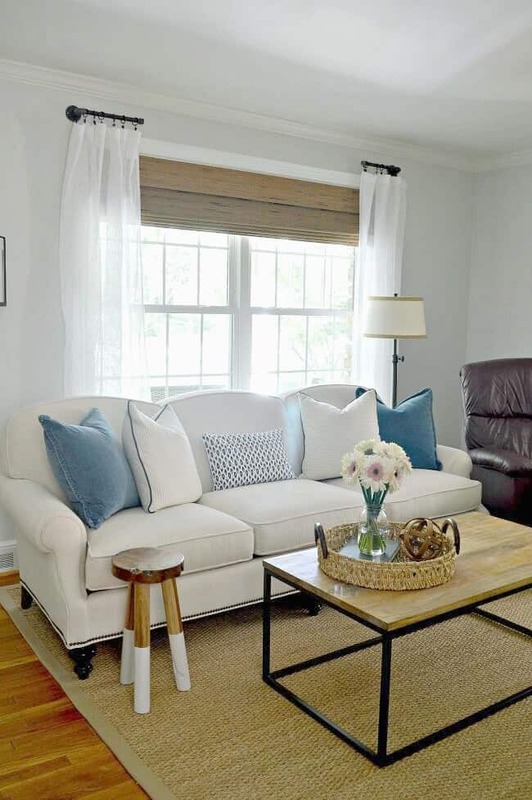 Is this the same paint color you used (Paper White) in the other rooms? It looks a little darker. You have such a way with small spaces. Love this as I live in a small house myself! Thanks so much for your sweet comment, Linda! We are really enjoying the space and I love the new layout. I’m not concerned about privacy at all, no one can see us, so I’ll probably just leave it as it. I’m not big on window coverings anyway. 😉 I was going to use the same paint that I used in the kitchen and living room (Paper White) but I wanted something a bit different. I went with BM Gray Owl in here, 75% strength. It is a bit darker, maybe not as dark as it looks in the photo. There’s something about Gray Owl that just keeps bringing me back. I appreciate the comment about decorating small spaces. It’s been a learning experience for sure, but I love the challenge. Thanks so much, Debbie! I never thought we would enjoy it but it’s become a great space to relax. Finn even loves it. Now that the painting and lighting is done, I’m ready to keep going. Not sure the hubs is thrilled about it.